This is a chronologic listing of bathing scenes that appeared in anime, manga and other related media in the year 2014. "Nobunaga the Fool episode 1"
There is a bathing scene on a card. There is a Shower scene with Karin Orte. "Silver Spoon 2nd Season episode 1"
"Strike the Blood episode 13"
There is a Furo scene between Astarte and Kanon Kanase. "Saikin, Imouto no Yousu ga Chotto Okashiinda ga. episode 2"
There is Dream Sequence bathing with Cecil Sudou. Hanae Wakatsuki takes a Floral Bath in a Clawfoot Slipper Bathtub. "Saikin, Imouto no Yousu ga Chotto Okashiinda ga. episode 3"
"Unbreakable Machine-Doll Specials episode 2"
Karyuusai Shouko, Irori, and Komurasaki take a bath in an Outdoor Bath. "Diamond no Ace episode 15"
"One Piece 17th opening credits"
There is a Bath scene with Cecil Sudou. "Strike the Blood episode 15"
There is a Tube Bath scene with Yuuma Tokoyogi. There is a Bath scene with Super Sonico. "Kill la Kill episode 16"
There is a Bath scene between Satsuki Kiryuuin and Ragyou Kiryuuin in a Bathing Pool. "Kingdom 2nd Season episode 35"
"Robot Girls Z episode 2"
"Sekai Seifuku: Bouryaku no Zvezda episode 4"
Itsuka Shikabane takes a Shower in a Clawfoot Bathtub when a Power Outage happens and she is seen Slipping. "Witch Craft Works episode 5"
There is a Flashback of a time when Kasumi Takamiya barged in on Honoka Takamiya while he was taking a Bath in a Unit Bathtub and joined him. 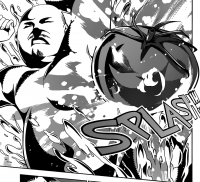 "Shokugeki no Soma chapter 56"
Osaji Kita has a Dream Sequence Bath in Tomato Juice after eating the Curry Bread Calzone that Isami Aldini made. "Nobunaga the Fool episode 5"
Himiko has a Floral Bath in a Barrel Bathtub. There is a Bath scene with Sonico. "Saikin, Imouto no Yousu ga Chotto Okashiinda ga. episode 6"
"Sekai Seifuku: Bouryaku no Zvezda episode 5"
Kosaki Onodera and Haru Onodera share a Bath in a Unit Bathtub. There is a Bath scene with an unnamed female. Mirajane Strauss is shown unconscious in a Tube Bath at the Tartarus guild after being captured earlier on. She is being watched over by Lamy and was going to be turned into a demon. "Chuunibyou Demo Koi ga Shitai! Ren episode 6"
There is a Swimsuit Furo scene. "Hoozuki no Reitetsu episode 6"
"Strike the Blood episode 18"
There is a Rotenburo scene with Sonico. Diane is shown bathing and washing with Soap. Mirajane Strauss is still unconscious in a Tube Bath at the Tartarus guild's lab. Lamy who is still watching over her is insulting her telling her that she wants to turn her into the ugliest demon possible. Mirajane then wakes up and breaks out of the tube bath standing in front of Lamy naked telling her that she can't do that since she is already a demon. "Kill la Kill episode 19"
There is a Rain Shower scene with many characters. There is a Flashback Bathing Scenes of Claude in a Clawfoot Bathtub and a Bubble Bath with Chitoge Kirisaki and Seishirou Tsugumi. Suzu Hagimura goes to take another Bath at a hotel's Public Bath sometime after having one Off Screen. In the bath, she is mistaken for an older woman by a woman and her child. Aria Shichijou comes in wearing a Towel and goes to sit on a Bath Stool to wash and reveals that she forgot to take off her chastity belt. There is a Shower scene with Dandy. "Little Busters! EX episode 2"
"Unbreakable Machine-Doll Specials episode 3"
Frey takes a Bath in a Clawfoot Bathtub. "Sword Art Online Progressive chapter 8"
Asuna Yuuki takes a Bath in a Clawfoot Bathtub while reading a Book. "Strike the Blood episode 20"
There is a Shower scene with Yukina Himeragi. There is a Shower scene with Dr. H.
"Witch Craft Works episode 9"
There is a Flashback Bathing Scene of Ayaka Kagari stalking Honoka Takamiya getting his back washed during a Furo by Kasumi Takamiya and being jealous of her. "Nagi no Asukara episode 22"
"Kill la Kill episode 21"
There is a Bath scene with Mako Mankanshoku, some Skinny Dipping and Ryuuko Matoi takes a Blood Shower. "Strike the Blood episode 21"
There is a Shower scene with Asagi Aiba. "Doraemon: Shin Nobita no Daimakyou - Peko to 5-nin no Tankentai"
"Wake Up, Girls! episode 9"
"Sekai Seifuku: Bouryaku no Zvezda episode 9"
Super Sonico gives Rice a Bubble Bath in a Bath Bucket. "Kill la Kill episode 22"
Ryuuko Matoi takes a Blood Shower. "Saikin, Imouto no Yousu ga Chotto Okashiinda ga. episode 11"
Ruri Miyamoto has a Bath. There is an Onsen scene as the eye-catch. "Mikakunin de Shinkoukei episode 11"
Juvia Lockser begins her day by turning on the shower in in her dorm room and starts Singing in the Shower. She is then seen Soaping up her breasts with a Sponge made the look like Gray Fullbuster while she appears to be Self Pleasing herself with her other hand. When she finishes showering, she takes a Towel from her towel rack and wraps it over her body with it showing a picture of Gray doing a thumbs up with the words "Gray Sama Love" written on it and starts drying off. "Toaru Kagaku no Railgun S OVA"
"Chuunibyou Demo Koi ga Shitai! Ren episode 12"
Aoi Kiriya, Ran Shibuki and Ichigo Hoshimiya take a Bath at an Onsen. "Strike the Blood episode 24"
April fools day joke by Hamham Soft of a fake game called Low-Ba which is an old lady dating simulator. One of the scenes shown in the joke advertisement is an Onsen scene. "Blade & Soul episode 1"
"Nagi no Asukara episode 26"
Son Goku is in a Tube Bath. "Akuma no Riddle episode 1"
"Kenzen Robo Daimidaler episode 1"
"Amagi Brilliant Park chapter 3"
Isuzu Sento has a Bath scene. "Soul Eater Not! episode 1"
There is a Dream Sequence Bathing scene with Tsugumi Harudori. "Fuuun Ishin Dai Shogun episode 1"
"Gochuumon wa Usagi Desu ka? episode 1"
Chino Kafuu and Cocoa Hoto take a Bath in a Clawfoot Slipper Bathtub. "Knights of Sidonia episode 1"
"Selector Infected WIXOSS episode 2"
"Date A Live II episode 1"
"Kenzen Robo Daimidaler episode 2"
"Seikoku no Dragonar episode 2"
"Kamigami no Asobi episode 2"
"Kanojo ga Flag wo Oraretara episode 2"
"Love Live! School Idol Project 2nd Season episode 2"
"No Game No Life episode 2"
"Akuma no Riddle episode 3"
"Date A Live II episode 2"
"Kamigami no Asobi episode 3"
"Akuma no Riddle episode 4"
"Fuuun Ishin Dai Shogun episode 3"
"Gochuumon wa Usagi Desu ka? 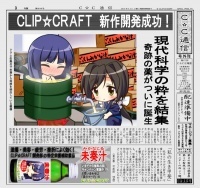 episode 3"
Sharo Kirima and Chiya Ujimatsu take a Bath in a Clawfoot Slipper Bathtub. Chino Kafuu and Cocoa Hoto bathe in it right after them Off Screen and then we see Rize Tedeza take a bath in it. "Kekkon Yubiwa Monogatari chapter 2"
There is a Mixed Bathing scene in a Bathing Pool. There is a Swimsuit Public Bath scene. "Date A Live II episode 3"
"Kenzen Robo Daimidaler episode 4"
There is a Tube Bath scene and a Shower scene. "Seikoku no Dragonar episode 4"
"Gokukoku no Brynhildr episode 4"
"Hitsugi no Chaika episode 4"
Chaika Trabant takes a Bath in a Bathing Pool and is joined by Akari Acura. "Akuma no Riddle episode 5"
"Kenzen Robo Daimidaler episode 5"
"Seikoku no Dragonar episode 5"
"Sorceress of Katara chapter 14"
Felicia Cla Di Burrows takes a Bath in a Bathing Pool while talking to Carmine. "Soul Eater Not! episode 5"
"Mangaka-san to Assistant-san to episode 6"
There is a Skinny Dipping and an Onsen scene. "Ryuugajou Nanana no Maizoukin episode 6"
"Jojo's Bizarre Adventure: Stardust Crusaders episode 7"
There is a Shower scene with Anne. "Mahouka Koukou no Rettousei episode 7"
"Seikoku no Dragonar episode 7"
"Mangaka-san to Assistant-san to episode 7"
"No Game No Life episode 7"
There is an illiustration of a girl taking a Bubble Bath based on the con's beach theme that year. "Akame ga Kill! Zero chapter 8"
"Kekkon Yubiwa Monogatari chapter 3"
There is a Furo scene on the cover. "Kenzen Robo Daimidaler episode 8"
"Seikoku no Dragonar episode 8"
"Kanojo ga Flag wo Oraretara episode 8"
"Unbreakable Machine-Doll Specials episode 6"
"Akuma no Riddle episode 9"
"Escha & Logy no Atelier: Tasogare no Sora no Renkinjutsushi episode 8"
Jeanne d'Arc takes a Bath in a Slipper Bathtub. She takes a quick Shower in another chapter and also has a bath after Rider of Black gets out. "Selector Infected WIXOSS episode 9"
"Gokukoku no Brynhildr episode 9"
"Fuuun Ishin Dai Shogun episode 9"
"Akuma no Riddle episode 10"
"Selector Infected WIXOSS episode 10"
"Mahouka Koukou no Rettousei episode 10"
There is a Bath scene with Bathing Gowns. "Gokukoku no Brynhildr episode 10"
There is a Skinny Dipping scene from Clothing Loss. "No Game No Life episode 10"
"Akuma no Riddle episode 11"
"Gochuumon wa Usagi Desu ka? episode 10"
"Kenzen Robo Daimidaler episode 11"
"Seikoku no Dragonar episode 11"
"Gokukoku no Brynhildr episode 11"
"Love Live! School Idol Project 2nd Season episode 11"
"To the Abandoned Sacred Beasts chapter 2"
Nancy Charlotte Bancroft takes a Shower in a hotel's Clawfoot Bathtub. "Mangaka-san to Assistant-san to episode 11"
"Soul Eater Not! episode 11"
There is a Dream Sequence Bathing scene with Tsugumi Harudori and Anya Hepburn. "Lupin the IIIrd: Jigen Daisuke no Bohyou"
Fujiko Mine ends up in an Oil Bath where she is attacked. "Soredemo Sekai wa Utsukushii episode 11"
"Akame ga Kill! Zero chapter 9"
"No Game No Life episode 12"
"Mobile Suit Gundam: Char's Counterattack - Beltorchika's Children chapter 1"
"Blade & Soul episode 13"
"Yuri Kuma Arashi chapter 5"
Lulu Yurigasaki is taking a Bubble Bath in the school's Public Bath while Kureha Tsubaki is in the Changing Room Stripping. Lulu has a Flashback to when she used to take Baths with Ginko Yurishiro everyday. Kureha comes in and tells Lulu that she isn't supposed to be using bubble bath in the public bath and tells her that they need to drain the tub and refill it while Mitsuko Yurizono and Kaoru Harishima are seen stripping getting ready to bathe Off Screen. Lulu gets out of the bath and falls. "Hunter x Hunter chapter 345"
During a fight between Silver Fullbuster and Gray Fullbuster, Silver tells Gray a story of how he was originally the demon Deliora and was transferred into Silver's body which then shows a Flashback Bathing Scene of Silver in a Tube Bath. "Soul Eater Not! episode 12"
There is a Dream Sequence Bathing scene with Tsugumi Harudori, Anya Hepburn and Meme Tatane. "Free! -Eternal Summer- episode 1"
There is a Bath and a Shower Room scene. Miyo Tsukino takes a Bath in a Hot Spring. "Yama no Susume Second Season episode 1"
"Seirei Tsukai no Blade Dance episode 1"
"Free! -Eternal Summer- episode 3"
There is a clothed Shower scene. "Black Butler: Book of Circus ending credits"
There is a Bath scene in a Slipper Bathtub. "Akame ga Kill! Theater episode 3"
"Seirei Tsukai no Blade Dance episode 2"
"Shirogane no Ishi: Argevollen episode 4"
"Fate/kaleid liner Prisma☆Illya 2wei! OVA"
There is a Floral Bath scene. "Black Butler: Book of Circus episode 4"
"Rokujouma no Shinryakusha!? episode 4"
"Kindaichi Case Files R episode 17"
"Kiss x Sis OVA episode 10"
"Fate/kaleid liner Prisma☆Illya 2wei! episode 5"
"Zankyou no Terror episode 5"
There is a Shower scene with Haruka Koumi. "Akame ga Kill! Theater episode 6"
There is a Boiling Water Bath and a Bubble Bath in a Clawfoot Slipper Bathtub. At the end of the episode, Yayoi Isurugi takes a Bath in a Clawfoot Bathtub. "Momo Kyun Sword episode 6"
"Fate/kaleid liner Prisma☆Illya 2wei! episode 6"
"Zankyou no Terror episode 6"
Rouka Numachi and Suruga Kanbaru have a Clothed Shower Room scene. Suruga Kanbaru has a Skinny Dipping scene in a Dream Sequence. "Seirei Tsukai no Blade Dance episode 6"
"Sword Art Online II episode 8"
There is a Skinny Dipping scene with Kirito. Ikumi Suzuki takes a Money Bath in a Clawfoot Slipper Bathtub. 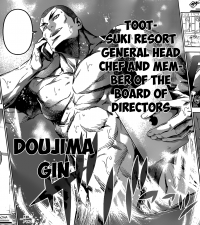 "Mahouka Koukou no Rettousei episode 21"
"Shokugeki no Soma chapter 83"
Gin Doujima answers a Phone call while he is taking a Bath in the Totsuki Resort's Public Bath and is seen standing up. "Momo Kyun Sword episode 8"
"Free! -Eternal Summer- episode 9"
There is a Bubble Bath with Fujiko Mine who is seen wearing a towel on her head and Leg Stretching. "Akame ga Kill! episode 9"
There is a Skinny Dipping scene with Mine. "Ressha Sentai ToQger episode 26"
Kagura Izumi (the Pink Ranger of the ToQers) gets lost and follows Akira Nijino (the Orange Ranger of the ToQers) where they discover that something odd is happening at the local Public Bath in Hironoyu Sentō bathhouse. The bathhouse owner is portrayed by Ken Nishida, who portrayed Mugensai Hinata in Hurricaneger Akira and Kagura are allowed to have a bath in the establishment which inspires the group to help out. After putting the bathhouse back in place, the owner grants Kagura and Akira's request for one last bath before they resume their journey. "Seirei Tsukai no Blade Dance episode 8"
"Fairy Tail: Blue Mistral chapter 2"
Wendy Marvell and Charle take a Bath together at Yoshino's house while spending the night. Yoshino let them use the bath first and quickly left to get some Soap for them but finds that they were already in the bath and finds a letter that was written for Wendy. There is a Bath in a Unit Bathtub with teeth brushing at the same time. "Futsuu no Joshikousei ga Locodol Yatte Mita episode 10"
"Persona 4: The Golden Animation episode 9"
"Shirogane no Ishi: Argevollen episode 10"
There is a Shower scene with Bernina. The Shower Room scene from last episode continues. "Akame ga Kill! episode 10"
There is a Shower scene with Esdeath. "Fate/kaleid liner Prisma☆Illya 2wei! episode 10"
"Ane Log: Moyako Neesan no Tomaranai Monologue episode 1"
"Persona 4: The Golden Animation episode 11"
"Akame ga Kill! episode 12"
There is a Hot Spring scene with Chelsea and Susanoo. There is a Bath scene with Momoka Sonokawa in a Clawfoot Bathtub. "Momo Kyun Sword episode 12"
Suruga Kanbaru has a Furo scene. There is Skinny Dipping from Clothing Loss. "Akame ga Kill! Zero chapter 12"
"Fatal Frame: Maiden of Black Water"
Yuri Kozukata takes a Bath in a Unit Bathtub and gets pulled under the water by a some black hair. When she emerges, she is in a coffin and a ghost is in the bathwater with her and then wakes up realizing that the entire bath was just a nightmare. "Suisei no Gargantia: Meguru Kouro, Haruka episode 1"
"Danna ga Nani wo Itteiru ka Wakaranai Ken ending credits"
"Madan no Ou to Vanadis episode 1"
There is a Shower Room scene with Elena Perepelkina. "Ushinawareta Mirai wo Motomete episode 1"
There is a Tube Bath and a Bath scene. "Akame ga Kill! Theater episode 14"
"Grisaia no Kajitsu episode 1"
There is a Bath and a Shower scene with Yuuji Kazami. "Orenchi no Furo Jijou episode 1"
There is a Bath scene with Wakasa and Tatsumi. "Amagi Brilliant Park opening credits"
Isuzu Sento takes a Bath in a Clawfoot Bathtub. "Amagi Brilliant Park ending credits"
An image of Muse Skinny Dipping is seen. While Erza Scarlet is deep in a fight against Kyouka, she loses consciousness and is briefly seen naked Skinny Dipping in a deep subspace filled with liquid. "Amagi Brilliant Park chapter 10"
Isuzu Sento has a Shower scene. There is a Bath scene in a Unit Bathtub with Singing. "Grisaia no Kajitsu episode 2"
"Nanatsu no Taizai episode 2"
There is a Bath scene on a picture on a bottle. "Orenchi no Furo Jijou episode 2"
"Ai Tenchi Muyo! 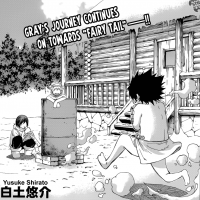 episode 7"
"Tale of Fairy Tail: Ice Trail chapter 4"
On the cover, Lyon Vastia is seen taking a Bath in an Oil Drum outside in the snow that is being heated up by Ur while Gray Fullbuster who is wearing a Towel is seen freezing running over to it. "Fairy Tail Zero chapter 5"
Mavis Vermillion and Zera wander away from the campground where the group they were traveling with was at and Zeira accidentally falls into a lake. While Zeira's clothes were wet she had an idea and starts Stripping and decides to go Skinny Dipping and tells Mavis to join her. Mavis then jumps into the water naked with her and starts Splashing her. Zeira tells Mavis that she sees fairies and then hugs her from behind telling her that they are in their hearts. There is a Flashback Bathing Scene of Lucy Heartfilia as a child taking a Bath with Aquarius having a Splash Fight in a Bathing Pool of Pink Bathwater while wearing a Towel. Aquaris gets mad at Lucy for always summoning her when she takes a bath and hits her with a tidal wave where Lucy is seen flying off with her Towel Dropping. "Sword Art Online II episode 15"
"Orenchi no Furo Jijou episode 3"
"Akatsuki no Yona episode 3"
There is a clothed Onsen scene. "Shantae and the Pirate's Curse"
Near the beginning of the game, Shantae takes a Bubble Bath in a Clawfoot Slipper Bathtub that was in her house. As she is already bathing in the tub she suddenly comes to the realization that she doesn't own a Bathtub and the tub ends up locking her in place and Risky Boots shows up revealing that it was a trap. "Amagi Brilliant Park episode 4"
Isuzu Sento has a Bath scene in a Clawfoot Bathtub. "Ore, Twintails ni Narimasu. episode 3"
"Shokugeki no Soma chapter 92"
Sonoka Kikuchi has a Dream Sequence of being shocked by an eel while Skinny Dipping in the Ocean after eating Ryou Kurokiba's Eel Matelote. "Orenchi no Furo Jijou episode 4"
"Yowamushi Pedal: Grande Road episode 4"
"Daitoshokan no Hitsujikai episode 4"
"Ore, Twintails ni Narimasu. episode 4"
"Yuuki Yuuna wa Yuusha de Aru episode 4"
"Boy Meets Harem episode 1"
There is a Bath scene, Sponge Bath scene and a Skinny Dipping scene. "Fate/Stay Night: Unlimited Blade Works episode 4"
Illyasviel von Einzbern takes a Bath in a Bathing Pool. "Madan no Ou to Vanadis episode 5"
"Akame ga Kill! episode 18"
"Orenchi no Furo Jijou episode 5"
"Yowamushi Pedal: Grande Road episode 5"
"Daitoshokan no Hitsujikai episode 5"
There is a Dream Sequence of Nagi Kodachi taking a Bath in a Clawfoot Bathtub full of Money. "Amagi Brilliant Park episode 6"
Isuzu Sento has a Bath scene in a Clawfoot Bathtub. Later on in the episode, a scene briefly shows Isuzu's Bathtub and then moves over to her who is already in her pajama's implying that she just finished taking an Off Screen Bath. The film starts with Nonoko Kishii taking a Bath. "Yozakura Quartet: Tsuki ni Naku episode 3"
There is a Shower Room scene and an Onsen scene. "Madan no Ou to Vanadis episode 6"
"Ushinawareta Mirai wo Motomete episode 6"
"Akame ga Kill! Theater episode 19"
There is a Hot Spring scene with Susanoo. "Sora no Method episode 6"
Raku Ichijou takes a Bath and Yui Kanakura attempts to join. "Orenchi no Furo Jijou episode 6"
"Denki-gai no Honya-san episode 7"
"Donten ni Warau episode 7"
"Akame ga Kill! Theater episode 20"
"Grisaia no Kajitsu episode 7"
There is a Bath scene with Sachi Komine. "Orenchi no Furo Jijou episode 7"
"Yuuki Yuuna wa Yuusha de Aru episode 7"
"Pokemon Omega Ruby and Pokemon Alpha Sapphire"
When you reach Lavaridge Town, there is an Onsen that the character your playing as (Brendan or May) can get into clothed. Unlike the original, the two old ladies who were bathing were removed and the Hot Spring is split in half with a males and females side but it doesn't matter which side you go into since there is nobody bathing in either one. Yui Kanakura walks in on Raku Ichijou taking a Bath. "Ai Tenchi Muyo! episode 29"
There is an image of a Bath in a Clawfoot Bathtub. "IS: Infinite Stratos 2 - World Purge-hen"
Cecilia Alcott has a Floral Bath in a Clawfoot Slipper Bathtub. "Ai Tenchi Muyo! episode 31"
"Ao no Kanata no Four Rhythm"
Misaki Tobisawa and Mashiro Arisaka and Rika Ichinose and Reiko Satouin and Asuka Kurashina bathe at an Onsen together. "Ushinawareta Mirai wo Motomete episode 9"
"Mushishi Zoku Shou episode 17"
There is a Flashback of Chitoge Kirisaki and Seishirou Tsugumi taking a Bath in a Clawfoot Bathtub. "Orenchi no Furo Jijou episode 9"
"Denki-gai no Honya-san episode 10"
"Grisaia no Kajitsu episode 10"
There is a Shower scene with Yuuji Kazami. "Daitoshokan no Hitsujikai episode 10"
There is a Bath scene with Nagi Kodachi. "Grisaia no Kajitsu episode 11"
"Shokugeki no Soma chapter 99"
Gin Doujima has a Dream Sequence of Skinny Dipping in the Ocean when he opens up Ryou Kurokiba's Autumn Pacific Saury Cartoccio. "Ane Log: Moyako Neesan no Tomaranai Monologue episode 2"
"Yamada-kun to 7-nin no Majo OVA episode 1"
"Ai Tenchi Muyo! episode 43"
"Ore, Twintails ni Narimasu. episode 11"
"Bee and PuppyCat episode 4"
There is a Bath House of cats bathing in Barrel Bathtubs. "Brothers Conflict OVA episode 1"
"Your Lie in April episode 11"
Lucy Heartfilia, Erza Scarlet, Juvia Lockser and Wendy Marvell infiltrate the Fiore palace during the end of the Grand Magic Games after party to try to secretly locate someone who is harming the guards and while going through the air ducts, they peek through and see that it is the girls side of the palaces Public Bath which was currently being occupied by Millianna, Beth Vanderwood, Kagura Mikazuchi, Levy McGarden, Mirajane Strauss along with many other unnamed females. Kagura throws something at the vent and Milliana asks whats wrong and Kagura tells her that she thought someone was Peeping at them. Juvia then looks through the other side of the vents to see Gray Fullbuster in the mens side of the bath who is bathing with Freed Justine, Jura Neekis, Lyon Vastia, Gajeel Redfox and other unnamed males. Gray uses his ice magic and throws a huge shard at the vent saying that he thought someone was peeking at them. "Madan no Ou to Vanadis episode 12"
"Shokugeki no Soma chapter 100"
Leonora Nakiri has a Dream Sequence where her clothes gets ripped off and bathing in virgin olive oil and wine vinegar after eating Akira Hayama's Scorched Pacific Saury Carpaccio. "Kekkon Yubiwa Monogatari chapter 10"
"Ore, Twintails ni Narimasu. episode 12"
"Amagi Brilliant Park Visual Fan Book"
There are images of Isuzu Sento taking a Bath. "Ikkitousen: Extravaganza Epoch episode 2"
There is a Rain Shower. There is a Furo scene with Koyomi Araragi and Tsukihi Araragi. The Furo scene with Koyomi Araragi and Tsukihi Araragi from last episode continues where Karen Araragi comes in and kicks Koyomi into Tsukihi and they both fall into the Bath in a Clawfoot Slipper Bathtub. Their are eleven cards in this game that feature bathing related images, three SR cards (Super Rare), three SSR cards (Special Super Rare), four UR cards (ultimate rare) and one SCR Card (Secret Rare). Mirajane Strauss is shown on two cards, One of them being an SR card where she is wearing a white Towel and Rim Sitting on a Hot Spring at an Onsen and the other being a UR card where she is having a Floral Bath in a Barrel Bathtub while Towel Bathing and having a Towel Headband on her head. 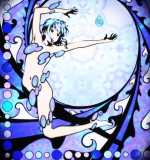 Lisanna Strauss is shown taking a Bath in an Onsen's Hot Spring while wearing a purple towel on an SR card. There is an SR card of Freed Justine and an SSR card of Bickslow which are a colored version of their hot spring scene from the chapter 212 cover of the manga. There is an SSR card of Flare Corona that is a shot of her in the Public Bath scene of episode 227 of the anime. Wendy Marvell is on an SSR card where she is sitting on the rim of an onsen wearing a pink towel. Cana Alberona is seen on a UR card having a bath in a Rotenburo drinking a sake cup wearing a yellow towel while resting her arm on the side and arching her leg. Yukino Agria is seen at an onsen wearing a white towel on a UR card. Erza Scarlet has a UR card where she is at an onsen Stripping off her Bathrobe getting to presumably bathe Off Screen. Lucy Heartfilia is on a SCR card where she is taking a bath in an onsen while wearing a white towel on leaning on the edge of the hot spring facing the viewer with a Bath Bucket in the corner. There is a Skinny Dipping. "Half & Half chapter 9"
There is a Mixed Shower scene..